Jaime Sabartes liked to see himself as 'the progenitor of Bue period blueness.' In this portrait Picasso has merged the profile of Casagema(a close friend who comitted suicide) with that of Jaime Sabartes. The portrait is distinguished not only for its blue tonality but also for its sobriety and the use of an enclosing line, which in its simplicity fixes an idea: the artist's compassion upon surprising his friend in his solitude. Sabartes left a description of how this painting came about. 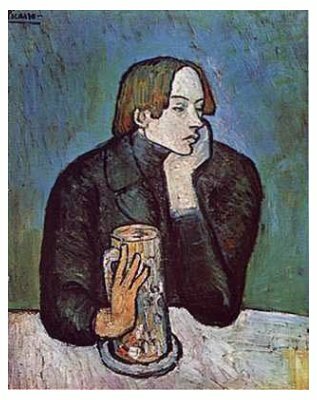 He was sitting alone and bored at the Cafe La Lorraine when Picasso appeared with their friends. "Unwittingly, I was serving as a model for a picture, a potrait about which I retain two distinct memories: the memory of my unpremeditated pose, in the cafe...( when I was thinking I was alone, I fell into the trap of Picasso's stare), nd the other is the impression I received a few days later in [his studio]...When Picasso put it up on the easel, I was astonished to see myself...[and] the specture of my solitude as Picasso saw it.